A stellar defensive effort across the board told the story as Schoolcraft held the Lumberjacks to just 52 points. The Ocelot foursome of Alexis Smith (21 points), Tabitha Mann (13), Jessica Parry (10), and Chelsea Wesley (9) not only led the way offensively, but outscored the entire Alpena CC team with 53 points combined. Kayla Shephard was the only Lumberjack to hit double digits at 17 points. Every Ocelot player clocked at least two minutes and all but two played eleven minutes or more. All buy two Ocelots recorded at least one point. 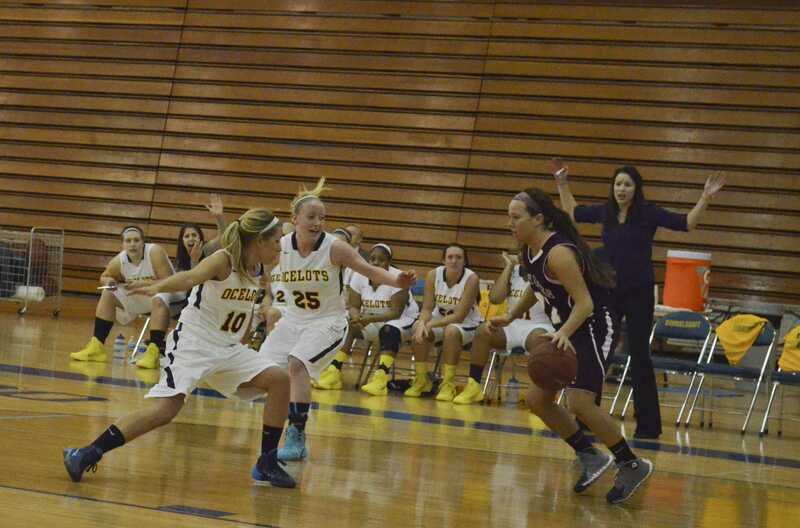 Freshmen Sara Gammons and Jessica Parry trap an Alpena ballhandler in the Ocelot’s Jan. 15 victory. A respectable first half for the Ocelots was put to waste as Oakland CC outscored Schoolcraft 55-34 after the Ocelots held a 33-30 advantage at halftime. 25 and 20-point performances from Tanner McCune and Miranda Fuerst respectively notched Schoolcraft’s hopes of ending their two-game losing streak. Tabitha Mann led Schoolcraft with 22 points and Alexis Smith finished with 13. Briana Berberet and Sara Gammons chipped in with 11 points each. Delta stormed past Schoolcraft in the Jan. 4 Pioneer 80-52 victory. The Pioneers improved to 10-2 with the win and the trio of Champagne Arthur, Taylor Mantyla, and Dy’Mond Perry proved to be too much for the Ocelots as they combined for 59 points. After Schoolcraft scored the first two points, Delta went on a 20-3 run to gain their lead. The Ocelots got to within six points with seven minutes remaining, but Delta closed the game on a 26-4 run. Jessica Parry led the Ocelots with 12 points and Tabitha Mann chipped in with 10. Sara Gammons and Alexis Smith had 12 points each in the Dec. 7 loss to Kalamazoo Valley CC. Schoolcraft struggled to find scoring outside of Gammons and Smith as the other Ocelots combined for only 26 points. Kalamazoo Valley jumpstarted their offense with three three-pointers in the first six minutes of the game. They never looked back and led 43-23 at half en route to the 77-50 victory.